That It Blinds Her Friends From Across The Room…. This is what you want for your future wife, right? 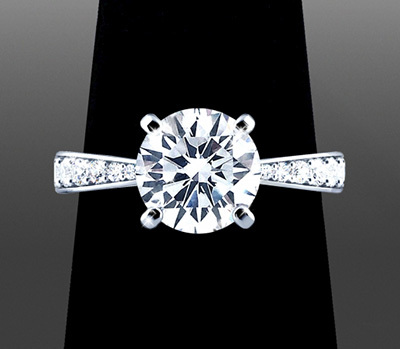 You don’t want to overpay for a brand name, but you do want an amazing ring without sacrificing quality. That isn’t a dream. It’s a real possibility. Finding the perfect engagement ring doesn’t have to be an overwhelming process – and it definitely won’t be if you work side-by-side with someone knowledgeable who guides you through the creative process. I’m Vanessa Nicole, master diamond setter, who designs custom engagement rings for clients worldwide. Whether you’re planning to surprise her with the ring, or you are both involved in the design process, what I provide is a BETTER way to get her perfect engagement ring. Your fiancé will know that you went above and beyond to create a ring exclusively for her. What you won’t hear coming out of my mouth are the cheesy lines many salespeople say. Really? How could this salesperson KNOW what will be perfect for her? They never asked about who she is as a person, what she does for a living to ensure it’s practical for every day wear, and they likely didn’t ask to see a photo of her so they can get a general sense of her style. Even if you haven’t experienced this exact situation, you can feel confident in knowing it happens in jewelry stores across the country every day. In a less-than-transparent industry, it’s important to be an educated buyer. But it’s not necessary to develop the expertise of a professional diamond buyer to find what you’re looking for. Sure, you can go down the rabbit hole of Google Search. Typically, my clients view me as the one at the top of the rabbit hole pulling them to safety. Keep your focus on the goal: How to wow her with the perfect diamond ring, one she can be proud to wear for the rest of her life. So why should you listen to me – Vanessa Nicole? For one very simple reason: I’m not a salesperson. As a master diamond setter, I’m the one who will actually design & create your ring. Graceful lines masterfully designed for Steve & Hannah's custom ring. With traditional stores, you meet with a salesperson that must meet a monthly sales quota. Otherwise they risk being fired. I’m not a salesperson and I never feel desperate to make a sale. I’m the artist making your ring and I decide how many clients to help each month. With all salespeople, there is pressure to “make the sale.” I am never under that pressure. Vanessa Nicole Jewels can only accept 8 clients per month. There is a cap on how many rings I can physically create each month. A 2ct Cushion Cut Diamond for an amazing couple that met during a cycling trip. Each carat signifies a year they've been together. Yes, I do fill all 8 slots. At the end of the year, my company will have helped 96 happy clients – and no more. Adding additional clients = I get burned out and start outsourcing the work like traditional stores. Then the quality begins to suffer and rings need to be repaired. That’s not my plan. I CHOSE my current business model because it consistently produces happy clients. As much as I might like to work with every potential client, there are only 24 hours in the day. Consequently, it makes sense to work solely with clients who are the right fit. Unlike salespeople, I am totally free to refer people elsewhere to find a better fit. About 30 clients come to me by referral each year. Spots do fill rather quickly considering my company has a worldwide clientele. There is a large pool for a limited quantity of client openings, and I do hope you get to be one of them. The ONE ring that symbolizes your love will not be made on an assembly line in a factory overseas. Unlike other jewelers employed by stores who must set a certain number of diamonds each day to “pull their weight”, I only work on rings when feeling inspired. This ensures your ring has my complete attention. I am passionate about the artistry of this, and passionate about the enormous satisfaction of the woman who is going to wear this ring for the rest of her life. No one else you deal with at traditional jewelry stores can be as focused on the artistry and symbolism of your ring. A salesperson that needs to meet a monthly quota can’t; a shop owner who has to cover the huge monthly rent at a mall can’t. A jewelry chain that is owned by a private equity firm (that also owns a Pizza Hut) can’t. None of them can afford to care as much as I do about your ring. Matt's Story: "When I first came to Vanessa I had spent 2-3 months waffling between chain jewelers and online diamond stores, learning about diamonds and searching for the perfect stone (and value). I first came to Vanessa for only a custom setting, but she also showed me a few stones. I was shocked at what great value the stones were (especially when compared to other jewelers), fell in love with one and never looked back. Throughout the entire process, Vanessa was very proactive in her communication and extremely responsive to questions. She really took the time to listen and understand what I wanted, and then exceeded my expectations (and most importantly my fiancees) with the final product." I actually collaborate with you on the design, and then go into the studio to create her treasured ring. You communicate with the same person – Vanessa Nicole – for everything rather than being passed on to one of my team members. You won’t get this kind of service anywhere else. The relationship that develops out of this collaboration is special. Many of my clients stay in touch for years. I’ve been invited to weddings, sent baby announcements, holiday cards. Later there are requests to design anniversary gifts. This doesn’t happen with a salesperson and it doesn’t happen with a manufacturer. Candidly, this experience is not for everybody. Some people don’t care if the ONE ring that symbolizes your unique relationship is made in an overseas factory. They don’t care it’s the same design worn by thousands of other women. And that’s okay… But will it be okay with HER? What story does she want to be able to tell about her ring?? Going to a chain jewelry store. Buying your engagement ring from a chain jewelry store is like telling your love that you’re taking her out to a special dinner and then going to Applebee’s. Do you really want that experience to symbolize your future together? No, you take her to Morton’s or Mastro’s. Back in the day, men used to work with true artisans to design her dream ring. Today, this is still the way Hollywood celebrities, Wall Street titans and European royalty obtain their engagement rings. I’m pleased to make this level of experience accessible to you. Vanessa Nicole Jewels harkens back to the time of Italian goldsmiths, a time when master jewelers met directly with their clients to fulfill their jewelry dreams. This is THE smartest choice for getting the best value. In my #1 bestselling book, The Perfect Custom Engagement Ring, I outline the precise steps for how to get exactly what the title suggests. My 2nd bestselling book, 67 Amazing Custom Ring Designs To Inspire Your Perfect Engagement Ring, also shows exactly what the title suggests. As you’ll learn, I’m quite literal. When talking to clients about their design & diamond options, you get the blunt, God’s honest truth. I only operate from a place of truth. In fact, I speak to my clients as I did to my own brother when he needed an engagement ring. You may not want to hear what I have to say if you request a 3ct D-Flawless diamond set with only 2 prongs so it appears to be floating, but I WILL say it. I began my career as a master diamond setter for high-end stores. I never felt fulfilled because the client’s reaction always occurred in the jewelry store showroom. I was in the back room working. There was always a barrier between salespeople and the jewelers. On Thanksgiving Day of 2010, I posted a video on YouTube. It showed me creating a custom engagement ring, and the response was immediate. As the owner of 5-star rated Vanessa Nicole Jewels in San Diego, CA, my company now has clients from nearly every state in the USA, along with a growing international clientele (Australia, South Africa, Sweden, Tahiti, Hong Kong, United Kingdom, etc.). Bruce from Papeete, Tahiti commissioned a stunning custom ring for the love of his life, Hinanui. We communicated via email to create his one-of-a-kind design and 6 weeks later, rather than have us ship the ring, he flew her to San Diego, stealthily picked up the ring and drove to a nearby winery for a surprise proposal. It was a trip of her lifetime and certainly one she’ll never forget. You might wonder why I would share this story, along with the story about how I got started in the diamond industry. The reason is because each of us has a story to tell. Your story is interesting because it is uniquely yours! Our clients say the reason they want a custom ring is because they want something unique. The woman you love isn’t a cookie cutter woman so you don’t want a cookie cutter ring. Consequently, I decided to integrate each client’s story into a customized engagement ring experience. When I started Vanessa Nicole Jewels and began meeting with different couples to create their rings, I heard so many great stories about how they fell in love. Your story matters—it’s genuine and personal, just like the relationship with your future fiancé. “The most important reason why Vanessa Nicole Jewels is the best is the ‘Making of the Ring’ video she creates for your significant other. Vanessa knows what she’s doing here. My fiancé knew this would be something we would have when I bought the ring, but she was not prepared for how awesome the video would be. As with many past clients, you may have seen my company in online reviews such as on Yelp or Google Reviews. Honestly, it’s fantastic that my reviews are 5 stars, and I’ll strive to earn your 5 star badge of honor as well. But while I swear to you that mine are all legitimate, you have no way of verifying them. I look at some jewelry stores’ 5 star reviews and they give me pause… Why? Some companies succumb to this dishonest approach to marketing, whereas at Vanessa Nicole Jewels, I can actually get any one of my reviewers on the phone for verification. You could point to any review and I’ll have their number ready within three minutes. Will other stores let you talk to three, five, ten of their reviewers? They won’t. (Unless THEY get to carefully select the people) But your choice? They’d never allow it. On the other hand, you could call every single person on my Yelp page to verify that their 5 star review is real. Matt Luxton wanted to surprise his wife of 20 years with a new rign, but didn't know what style to get her... until Vanessa designed her perfect ring. In the case of a surprise ring, you don’t know exactly what she wants and you can’t read her mind. There’s peril in that. Even if you have an idea of the general style she likes, which many men do, there are key things to consider, such as the ideal width for maximum comfort, height off the finger so it doesn’t snag, etc. When buying something for yourself, if you buy the wrong SUV, you only pay the price of being grumpy about driving your new SUV. If, however, you buy a house without her involved in the process and the kitchen isn’t the style she likes, you’ll have an issue on your hands. This is a big deal. So is her ring. She’ll be wearing it EVERY DAY, so it has to be right. As a woman, I know what women want in their engagement ring, and it’s proven from my 100% success track record. All of these things can backfire whether you get a pre-made ring or a custom ring. And THAT’S why clients choose my company, Vanessa Nicole Jewels. I give 100% of my focus to each client to ensure that not only is the ring perfect, but that it’s also a seamless experience for you. Most jewelry stores that sell mass pre-made rings also offer a custom ring service in order to appeal to everyone. Unfortunately, not every store that offers this service specializes in custom work. You won’t see me talking about a $200 silver graduation pendant while at the same time discussing a 20K engagement ring. No, my mind is 100% focused on diamond engagement rings 24/7. This is why Vanessa Nicole Jewels specializes solely in creating custom diamond rings. Nearly all jewelry stores outsource their custom rings, seeking the cheapest labor. Stores that don’t have routine experience with custom orders often fail to provide a smooth experience for the client. I’ve shared my story with you and hopefully you have a strong sense of my passion for making your future wife the happiest woman alive. She will be when she sees her custom ring. Like most men, you also want to kn​ow the specifics. I get it. To ensure 100% confidence prior to creating your ring, it will be CAD modeled on the computer to show photorealistic renderings of what to expect the final ring to look like. Once we have your approval, her ring is individually cast into white gold or platinum, stones are individually handpicked, and then they’re set under a microscope by a master stone setter. No assembly lines, no molds. Your ring will be exquisitely crafted to ensure maximum brilliance from each diamond using my proprietary diamond setting technique. There is a reason why my clients consistently say their ring sparkles more than their friends’ rings… My diamond setting technique is why. 1) You don’t have to settle. Finding the perfect ring can be overwhelming even if you know the style you’re looking for. But when you have your engagement ring custom made, you don’t have to worry about settling for something that’s merely close to what you had in mind. This way you know it’ll be perfect. 2) A little effort goes a LONG way. Even though the process will be easy, she will love that you went the extra mile to give her a truly special ring. You put in the extra time, you chose the design, and you got her the ring of her dreams. This is how to sweep her off her feet all over again! 3) 10X the value. Most engagement rings sold in the U.S. are made overseas, where the cost of assembly-line labor is dirt-cheap. These cost-cutting methods affect the quality tremendously. The rings are typically made by poorly skilled workers who have little or no interest in the people who will be buying the jewelry. Worse yet, the retail price tag of these rings is often based on hefty markups. That’s because they need to cover significant sales overhead, including advertising, salaries, and commissions. Wouldn’t you rather pay for better quality, meticulous attention to detail, and outstanding customer service at the same price? 4) It’s one of a kind like SHE is. When you buy a ring from a traditional jewelry store— especially one of the big chains—you’re giving your partner a hunk of jewelry that thousands of other women already own. Here’s what this says to HER: You don’t care enough; you were just fulfilling an obligation. Even if she never says it aloud, that IS what she’s thinking. Your partner sincerely feels like she deserves something special. This is how happy ALL of our clients feel. You will be working one-on-one with a master diamond setter and award-winning designer. You will not be handed off to a newbie salesperson moving from job to job. I’ll first find out what you really want in your custom ring. You’ll never be pushed in any specific direction, but I’ll offer you my guidance throughout the fun process. We will openly discuss balancing your ideal diamond size with your budget. Because we have NEVER had a client dislike their custom Vanessa Nicole ring… EVER. That’s how confident I am you’ll absolutely love your ring too. If you’re planning to get a diamond ring in the coming months, click on this button below to get a FREE hardcover copy of my book, The Perfect Custom Engagement Ring. What other product is worn 24 hours a day, 7 days a week for years? There isn’t any. This is why your choice needs to be spot on. This book is essential reading if you want to give your soon-to-be fiancé something to be truly proud of when showing off her ring to friends and family. You’re literally seconds away from beginning a memorable diamond ring experience you will RAVE about. PS: If now is not the time for you, I hope that time will come! And when it does, call (619) 800-0134. Please save this webpage in a place you can find it in the future. And feel free to request my book now for future planning. PSS: If you have a friend, business associate or someone in your circle who is at or near engagement ring time, please tell them about me, and encourage them to get my book. FRIENDS DON’T LET TRUE FRIENDS BUY ORDINARY RINGS FROM ORDINARY JEWELERS! Custom Made For Keith & Alyssa C.